When I first began to examine what was known about Jeremy Gregory it seemed very little. I knew of some of his apprentices taken through his brotherhood membership of the Clockmakers' Company, and I knew his year of death, but precious little about his life. As to examples of his work, they were virtually non-existent. But the more I looked, the more fascinating the information that came to light, to the point where it is difficult to decide what to leave out. If we summarise his work first, very few clocks are known. In the autumn of 1977 when Ronald Lee advertised for sale in Antiquarian Horology a bracket clock by him, he pointed out the scarcity of his work, in that at that time only one other bracket clock was known by him. This was one with a Royal connection in the form of a mount with the Royal Cypher of Charles II (then in the Victoria and Albert museum and said to show in it the influence of Edward East). Additionally Lee counted up three watches, one longcase clock and one lantern clock. Since then all that has come to light is a standard-sized lantern clock by him, which was sold at Christies in 1984 (which of course may well have been the same one that Lee recorded in 1977), and the delightful miniature striking lantern clock illustrated here. Gregory signed his clocks, or his engraver did, in varying ways with varying spellings, even of his own name. I have commented on this factor before, whereby clockmakers of the seventeenth century seemed completely unconcerned as to how the engravers spelled anything, including even the makers' own names. The Royal Cypher clock is signed 'Jeremie Gregory near ye Royall Exchange', the other bracket clock 'Jeremie Gregory near ye Royall Exchang London'. Both these clocks are signed a second time on a plaque attached to the front of the case, which is very unusual practice. The lantern clock sold in Christies is signed 'Jeremie Gregory Neare the Royall Exchange London', and this present one 'Jerimie Gregorie at ye Royall Exchange'. Four different clocks each with a variation of the spelling of the name or address or both! In summary we have a total known output of three watches, two bracket clocks, one longcase clock and two (possibly three?) lantern clocks, and this from a man who was in business for forty-two years! It represents an output of one item every five years! He hardly seems to have been exerting himself. So why is that? What was Gregory doing for forty-two years or so? Jeremy Gregory was a goldsmith. He was born in 1621, the son of Edward Gregory, Esquire, of the parish of St. Dunstan's in the West, London, baptised at St. Bride's Fleet Street on the second of February. He was apprenticed in the Goldsmiths' Company in 1638 to Jeremy East, who was brother to no lesser person than Edward East, then, or soon to be, the most famous clockmaker in the land, and already a leading figure in the Goldsmiths' Company and the Clockmakers' Company. Edward East had been appointed, against his will, to be one of the first Assistants at the founding of the of the Clockmakers' Company in 1632. This was no doubt at the command of David Ramsay, who held the salaried office of Royal Clockmaker, and was appointed the first Master of the Company, even though he didn't bother to attend their meetings. He was referred to in the Company as 'Squire Ramsay', and what Ramsay requested, you had better do - though Ramsay himself did not attend any meetings for the first two years. In fact after 1634 David Ramsay never attended any Company meetings, with the exception of a spell between 1652 and 1654 when he attended in order to vote himself a grant from Company funds to compensate him for his sufferings as a 'persona non grata' during the Civil War, a time when Royal Clockmakers were not in fashion. It is thought that Jeremy East, worked mostly with, or for, his brother Edward, though several watches are known bearing Jeremy's own name. If Jeremy Gregory was trained in, and worked in, the East camp, it is hardly surprising that his work shows their influence. Gregory would have finished his apprenticeship under East by 1644, and was made a free Brother in the Clockmakers' Company in 1646, though there is some confusion in the records as to whether he was admitted again in 1652. Gregory may well have worked for some years in the East 'company'. They seem to have been a group of Royalists who banded together to bend the rules in their own favour and against the interests of those in the Cromwellian camp and were not opposed to re-electing each other into office to keep that control. Often these clockmakers were closely related to each other and were in effect groups bound together by politics and kinship, which ties greatly affected their commercial progress. Jeremy Gregory was one of this group, who were often complained against by several Company freemen for illicitly employing foreigners, the very problem the Company had been formed to prevent. These dissatisfactions against certain of the Company administration culminated in 1656 in a petition to the Lord Mayor by thirty three complainants. A counter-petition was presented from those complained against, which on the rough draft were nineteen in number, but on the revised neater version numbered only fourteen, and they included Jeremy East and Jeremy Gregory - as well as two names of men who were not even members of the Company at all! It is perhaps to his credit that the more senior figure of Edward East, who signed the rough draft, had the conscience to remove his name from the final version. 1. This is a miniature clock standing only 9 inches high, 6 1/2 inches in the pillar height, 3 3/4 inches chapter ring diameter. Probably dating from the 1680s. The minutes of the Clockmakers' Company abound in quarrels and complaints against the abuse of the system by the administration. Amongst Jeremy Gregory's accusers on other occasions was John Nicasius, a fiery-tempered man who would abuse anybody at the drop of a hat, and did! Nicasius was never a man to mince words and abused Jeremy Gregory in 1668, when the latter was Master, but later apologised. Later, in 1679, he gave Henry Jones the rough side of his tongue, when Jones was Master, and although the Company tried to make allowances for Nicasius 'considering his usual temper too well known to all persons of the Court', Henry Jones insisted that he was suspended from the Company until he apologised - which he never did and after which Nicasius never attended again. Jeremy Gregory married for the first time about 1647 to a lady named Elizabeth. Her surname is unknown as the marriage has not been traced, but other family relationships suggest it was probably Turner. His first child was baptised in 1648 at the church of St. Michael's Cornhill, where other children were also christened. By 1658 he had changed to attend the church of St. Christopher le Stocks, not far away, where five more children were baptised, the last in 1660. His wife died some time in the late 1660s and about 1669 he married again, to Susannah Hancock, believed to be the widow of goldsmith Robert Hancock. We learn later that Susannah came with her own fortune, which Jeremy Gregory acknowledged in a pre-nuptial settlement and something he made allowance for in his own will. Not only was Jeremy Gregory connected with the trade through his training, but his 'uncle' was Thomas Whaplett, a member of the Vintners' Company since about 1640, but involved in the clock trade, though it is not clear in what respect - perhaps he supplied wine to the Clockmakers Company?. Whaplett was known to the Clockmakers' Company but was not a member, though in his will in 1679 he left the company a bequest of 'one silver tankard, white, to the value of £6.00 and to have my coat of arms and this superscription engraved thereon "The Guift of Mr. Thomas Whaplett" ', as well as leaving bequests to Jeremy Gregory and his children. Whaplett was a very wealthy man, a multimillionaire by today's standards. Amongst many bequests he left 'my great gold ring with all my Armes on it, which was my father's', as well as bequests to over sixty individuals, plus an incalculable number of poor children and adults of various establishments, city companies, charities and parishes. But the first thing he left in his very lengthy will ('contained on ten sheetes of paper written upon one side thereof to everie sheete or leafe I have subscribed my name with my own hand and at the Topp of the first sheete and neare the end of this writing of this last sheet I have set my seale') - was one hundred and twenty pounds to pay for his own funeral! He really wanted a good sendoff, so much so that he left a small fortune for those who attended to buy funereal clothing and mourning rings. He seems to have been a bachelor, and it would appear that he lived his last years at least in the household of Jeremy Gregory, whom he called his 'cousin'. This term then covered all kind of relationships, and it seems Thomas Whaplett was related to Gregory through marriage, being the uncle of his first wife. In 1665 he stood as bondsman for Gregory along with Gregory's brother-in-law, Samuel Lloyd of Shrewsbury. In 1679 Whaplett left considerably property to Jeremy Gregory, including a half share of a house in Friday Street, as well as a bequest to 'all the servants of Jeremy Gregory who live with him at the time of my death' - the latter because they would have looked after him in his last days . By 1662 Jeremy Gregory had his own premises in Cornhill, 'near the Castle Tavern', at which time Jeremy East worked in Fleet Street with his older brother, Edward. We can therefore be fairly certain that Gregory worked independently by 1662, and possibly much earlier, though he may still have taken on outwork for the East 'company'. In 1665 to 1668 he was Master of the Company and again in 1676. On April 4th 1670 his eldest daughter, Rebecca, aged twenty, was married at St. Dunstan's in the East to Richard Halstead, a clockmaker literally only a few days out of his Clockmakers' Company apprenticeship - he was forbidden to marry while still an apprentice. She was either desperately in love or pregnant, or both. This might have been the reason they married about as far away from her home parish as they could get, to avoid parading past the neighbours the heavily-pregnant daughter of such a prosperous and respectable gentleman as Jeremy Gregory had now become, along with 'uncle' Thomas Whaplett. By now Jeremy was rich enough to be able to provide a dowry, as he tells us in his will - which is just as well, since a newly-freed apprentice clockmaker would be penniless. Unfortunately Richard Halstead died prematurely in late 1677 or early in 1678, aged only about thirty one. It is more than likely that Richard Halstead had worked for Edward East, because his apprentice, Benjamin Jones, only two years into his training with him at the time of his death, was then transferred to East. Here is yet another link with Edward East and it may have been through Jeremy Gregory's trading contacts with the East company that Rebecca had met Halstead in the first place. Rebecca remarried, this time in February 1678 to Richard Jarratt, a freeman of the Salters Company but a maker of clocks and a free brother in the Clockmakers' Company. The company a man joined did not necessarily reflect the nature of the trade he followed - he might have joined a company with which his family had earlier links. Again her father provided a dowry - we know because he stated in his will that he left her only a token bequest 'and no more, having twice advanced her in marriage'! Twice was enough. It seems as if Rebecca was unlucky with her husbands for Richard Jarratt, though himself Master of the Clockmakers' Company in 1686, later suffered ill health and was granted occasional charities by the Company after 1693. He ended his days in poverty, being sent in 1696 to Ludgate, the debtor's prison, and two years later he was dead. Jeremy Gregory's death ten years earlier had saved him the shame of knowing this, as well as the expense of bailing his son-in-law out. It was unlikely Jeremy's widow would have done so even though she certainly had the means, for she was of course Rebecca's stepmother, not her real mother. In November 1685 aged sixty four Jeremy Gregory wrote his will, being 'ill in body'. Just over six months later he was dead. He died on the 4th June 1686 and was buried St. Michael's Cornhill. His will was proved the following December. As another millionaire in today's terms he was not too ill to set down his wishes in minute detail, especially those involving money and property, of both of which he had large quantities. He had the will written at great length in the style of 'uncle' Thomas Whaplett's on 'nine whole sheets of paper and this part sheet, to every one of which I have putt my hand and seale'. He mentions that on his second marriage (about 1669) he had signed a marriage settlement, presumably because of the sheer value of his wife's property, to agree to leave her £200 'which I am obliged by writing on marriage to leave her at my death'. She had owned considerable properties from her first marriage including an estate at Sunning Hill in Berkshire and other lands at Egham, which lands he had later sold off with her consent. Instead of that £200 he made her many bequests, including such interesting items as all the furniture and silver plate from Sunning Hill, 'all the (silver) plate her mother and sister gave her, and my silver plate and candlesticks, and all her rings, jewels and books at the time of her marriage, also my gold clock and my picture in gold set in diamonds, and also my own picture (i.e. his portrait) and hers drawn by Mr. Riley and everything else I gave her - but my picture after her death to go to my son. Jeremy ... also the walnuttree chest of drawers in my house in Cornhill'. 2. 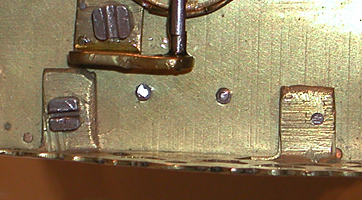 This closeup of the front fret shows the screw and pin method clearly. His bequests included, to his son, Jeremy junior, 'my church ring set with two diamonds'. The son seems not to have followed his father's trade, but the grandson, also named Jeremiah, had just become an apprentice that year - 1686 - and did. His unmarried daughter, Martha, could choose to have the half share of the Friday Street house or £420 cash. His journeyman, 'Mr. Jones', the Thomas Jones he had taken as apprentice in 1672 and who was still with him, was to get twenty shillings for helping the family dispose of his clocks and watches - and so put himself out of work, as the business would then be closed down. From this will we can see that Jeremiah Gregory was a very wealthy man, connected to an even more wealthy family. His income came from various sources, but presumably first and foremost from the goldsmith's trade. He even left a 'gold' clock - what kind it was I have no idea as I have never before heard of one. Perhaps some sort of small spring clock. Certainly it would not have been a longcase or a lantern clock. This is why the making of regular clocks for commercial customers can hardly have figured high in the scheme of things of a man who had 'his picture in gold set in diamonds' - presumably a gold silhouette with a diamond-studded frame. The full size lantern clock mentioned above was signed across the upper dial centre. Originally a balance wheel, converted later to anchor escapement, its alarmwork and alarm disc had been removed and it dated from about the 1670s. The clock illustrated here is a miniature, total height 9 inches, chapter ring 3 3/4 inches diameter. How rare this clock is can be judged from the above summary. It is an exceedingly rare item, though is not the one made of gold mentioned in Gregory's will! But the clock has some interest in its own right. It is a re-converted verge pendulum, which also strikes the hour - miniatures are more commonly non-strikers with alarmwork. Examination of this charming little clock shows a strange tiny filled hole in the dial just above the VI of the chapter ring. Removal of the dial shows this plug clearly, and the reason for it. The arbor of the pinion of report must have fouled against the dial, perhaps causing a hole to wear there. The arbor has then been shortened, which meant cutting a groove into the pinion to receive the holding pin. Whether that pinion was made overlength originally, or was a replacement, I cannot tell. Each fret attaches to the top plate by one screw and one pin. This is a very uncommon practice. Why would he do this? Well, the pins take up less space than screws would and there is never much spare space on top of a miniature clock. Certainly the left-hand side is cramped because of the hammer counter nut, but the right-hand and front frets have plenty of room for a second nut. I have seen this done before, on two Civil War period clocks by Thomas Knifton and on a later provincial clock by George Guest of Aston, Birmingham. Nevertheless it is most unusual practice, which I don't think has been commented on before, other than by myself. And the reason for it? The only one I can think of would be to save money, as a pin is cheaper to make and fit than a screw. I imagine the chance to save a few pennies would appeal greatly to a man who had his portrait done in gold and diamonds! A single, different photograph of this clock was illustrated in 'English Lantern Clocks' by George White, published in 1989 by the Antique Collectors' Club, from whom we understand a reprint is due later this year. This article with additional photographs published in Clocks Magazine.